Native Guides and English-Speaking Naturalists will guide you through an extensive trail system filled with wildlife in what many consider the most biologically-diverse lodge in the entire Amazon. Custom birdwatching packages can be designed according to your needs. 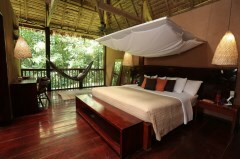 *Shorter and longer stays are also available at Posada Amazonas Lodge. For more information, feel free to contact us. Upon arrival from Lima or Cusco Airport, you will be met by a representative from Posada Amazonas, and transferred to Tambopata River Port. You will embark on a 45-minute boat ride to Posada Amazonas and will pass by the Community's Primary Forest Private Reserve. After checking in to your room, join a welcome briefing presented by the lodge manager. Spend the afternoon at your leisure before a hearty dinner followed by a Canopy Tower Walk. A twenty minute walk from Posada Amazonas leads to the 30 meter scaffolding canopy tower. A bannistered staircase running through the middle provides safe access to the platforms above. There are three main platforms, each giving visitors a different perspective of the forest. The lowest platform is at the same level as the upper under story and can result in good looks at tamarins and Dusky Titi Monkeys. The next platform is at the same level as the canopy, and the highest platform actually lets you look down at the tops of hundreds of trees. After dinner, join the lectures hosted by the staff at Posada Amazonas on their interesting stories. 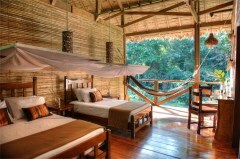 Posada Amazonas was created as a joint venture between the owners and the Native Community of Infierno. Often regarded as one of the world’s best examples of successful ecotourism, this lecture provides an in-depth look at the history and development of the lodge. Tres Chimbadas is thirty minutes by boat and forty five minutes hiking from Posada Amazonas. Once there, you will paddle around the lake in a catamaran, searching for the resident family of nine giant river otters (seen by 60% of our lake visitors) and other lakeside wildlife such as caiman, hoatzin and horned screamers. Otters are most active from dawn to 8-9am in the morning. A twenty minute boat drive downriver leads you to a trail designed by the staff of the Centro Ñape. The Centro Ñape is a communal organization that produces medicines out of forest plants and administers them to patients who choose their little clinic. They have produced an Ethnobotanical trail which explains the different medicinal (and other) uses of selected plants. 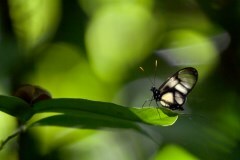 Hundreds of frogs stay concealed in the surrounding vegetation, wild cats like Jaguars, Pumas, and Ocelots prowl the undergrowth, and a bewildering array of insects chirp, chitter, and hide in the foliage. After dinner, you will have the option of hiking out at night, when most of the mammals are active but rarely seen. Night hikes through the jungle with one of the experienced guides often result in amazing looks at bizarre insects that look as if they come from another planet. Night Monkeys leap through the canopy of the forest, and beautiful, brilliant frogs with shapes and sounds as bizarre as their natural histories. This morning. you will visit a clay lick used by both parrots and parakeets. You will see parrots and parakeets descend on most clear days to ingest the clay on a bank. Species such as Dusky headed and Cobalt winged Parakeet descend at this clay lick. Later on, depart on a two hour hike crowned by the largest tree in the vicinity: a giant Ceiba tree. During the hike you will focus on the natural history of the rain forest and its principal taxonomic groups. Trees in the Peruvian rainforest can be quite impressive. After lunch you will visit a nearby farm to learn about the variety of popular and unknown Amazon crops. 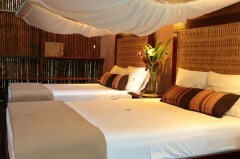 Return to the lodge for dinner and an evening relaxing in the serene atmosphere of the Rainforest. 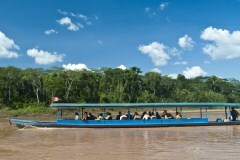 After breakfast, transfer to Tambopata River Port and take a boat ride back to Maldonado Headquarters Port. Upon arrival, you will be taken to the airport for your outbound flight. 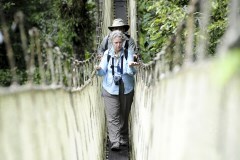 Posada Amazonas Lodge offers a range of activities that are available at an additional cost. For a detailed list of excursions and rates, please contact us for more information.